In its fresh bid to counter the RSS-BJP Sangh Parivar at the grass-roots level and to increase its party cadre base, All-India Congress Committee (AICC) general secretary Rahul Gandhi today launched a training programme for six delegates each representing 68 constituencies in the state. Not wanting to miss out the opportunity to gain dividends from the infighting plaguing the two main political players, the third front in Himachal is beginning to take shape with the non-Congress and non-BJP parties, including the CPM, CPI, Himachal Lok Hit Party (HLP) and Himachal Swabhiman Party (HSP), forming a sub-committee to forge a formal alliance. The Congress has accused the BJP government of handing out a raw deal to fruit growers and said it had failed to increase the support price for procurement of apple under the market intervention scheme (MIS) over the past four years, providing a glaring example of its anti-growers attitude. With the process of renewal of the total 16.31 lakh ration cards in the state yet to begin and depot holders declining to give subsidised food items to people on old cards, there is utter confusion with no word from the government on extending the deadline of June 30 with the process yet to take off. Private universities in the state will not only have to provide reservation for various sections of society in accordance with the government policy but also ensure minimum number of teaching days in an academic session and maintain a complete record of the entire process of selection of students for admissions. Tibetans living in exile in Kangra district have been advised against falling in the trap of touts and middlemen who offer to buy benami land for them. The suggestion came to the fore in a meeting titled “Indo-Tibet meeting for peaceful and co-exist relationship”. Aimed at enhancing the level of processing of perishable foods from 6 per cent to 20 per cent and value addition from 20 per cent to 35 per cent nationally, the centrally sponsored National Mission on Food Processing (NMFP) has allocated Rs 1.12 crore to Himachal for initiating preparatory activities to promote food processing industries. Through a notification issued by the Himachal Pradesh Government recently, about 11 panchayats and Bakloh cantonment board area of Bakloh police post falling under the Dalhousie police station being put under the control of the Chowari police station for the convenience of the general public. With former Chief Minister Virbhadra Singh assuming the reins of the Congress Campaign Committee and persistent moral pressure of people, including Congress workers, supporters and well-wishers, has finally compelled Congress stalwart and former Cabinet minister Harsh Mahajan to think over his strategy for contesting the Assembly elections from Chamba. The ruling BJP said today that with former Union Minister Virbhadra Singh, against whom charges have been framed by court being made head of the Congress election campaign committee, the BJP only stands to gain as this clearly indicates that the Congress has compromised with corruption. “Before seeking party ticket, aspiring candidates should analyse their capability to win,” general secretary of the state Bharatiya Janata Yuva Morcha (BJYM) Rajender Thakur, who is also the poll observer for Chamba district, said this here yesterday. All-India Congress Committee (AICC) poll observer for Chamba district Jahida Khan has appealed to Congress leaders and the rank and file of the party to transmute BJP’s “Mission Repeat” into “Mission Defeat”. A team of experts from the Forensic Science Laboratory, Junga and Bharari, today lifted various samples, including finger prints from the Scorpio car of BSNL’s AGM Shushil Kumar who was found murdered near his office yesterday. The Dalai Lama will attend his birthday celebrations on July 6. Tashi, spokesperson of the Central Tibetan Administration (CTA), in a press statement here said they were planning to make this year's birthday of the Dalai Lama a high-profile event. The HPSEB Pensioners’ Forum has expressed resentment over the failure of the managements of the state power utility and the government to settle the issues related to pensioners and urged Chief Minister PK Dhumal to intervene in the matter. The government has increased the support price for procurement of mango under the market intervention scheme (MIS) for this season. An official spokesperson said the issued MIS had been notified under which 300 tonnes of seedling varieties and 200 tonnes of grafted varieties of mangoes would be procured. Taking a strong offence to accusations levelled by Congress leader Virbhadra Singh that the CD case against him was politically motivated, the police today clarified that the case was the result of impartial, fare and objective investigation with sufficient corroborative evidence. The government has banned the use of expression “handicapped” in its official correspondence, official reports, institutions and organisations. An official spokesperson said here today that the decision had been taken on the plea of Chief Commissioner for persons with disabilities. Though Rahul, while addressing delegates, did not elaborate on the training programme, he appealed to them that the Congress respected all Congress workers as they were the real torch-bearers of the party. Before Rahul, Union Commerce and Industry Minister Anand Sharma said the RSS-BJP, Team Anna and Ramdev were out launching a propaganda campaign in the country casting aspersions on even Prime Minister Manmohan Singh, who was known for his integrity and honesty. “We need to identify and counter these people hitting only at the Congress in the country and in the state,” he alleged. He urged delegates to educate the public on the contribution made by the UPA government to the state. CLP leader Vidya Stokes said the present BJP government was only there for making money. Corruption charges against the government were levelled by its Kangra MP Rajan Sushant and the Rohru MLA had questioned the BJP leadership. “We have to educate the public on this and the development made by the Congress government in the state over the years,” she added. State party in charge Birender Singh said the BJP government was the most corrupt and was implicating Congress leaders in false cases. Earlier, Virbhadra Singh said the Congress would contest and counter BJP propaganda on its own strength and not on its weaknesses like its infighting. The sub-committee comprising representatives of these four parties will hold a meeting here tomorrow to work out the modalities to be able to form a third front which can emerge as an alternative to the Congress and the BJP that have alternately ruled in the hill state. It is the impressive victory of the CPM in the Shimla MC elections which has brightened the chances of a good poll prospects of the third front. After holding the meeting, the four parties will hold a convention here on July 11 where they will formally launch the third front. The third front is hoping to gain from the bickering within the BJP and the Congress. Interestingly, it was not just leaders from the CPM, CPI, HLP and HSP who held consultations here last night, but the presence of Kangra Lok Sabha MP Rajan Sushant was the surprise element. Even though Sushant has been suspended by the party for his anti-party activities, he is still a BJP MP and his joining the third front on being expelled from the party cannot be ruled out. HLP chief and former BJP president and Rajya Sabha MP Maheshwar Singh said there was no question of his returning to the BJP. He, along with former ministers Shyama Sharma, Mahinder Singh Sofat, former MLA, KD Dharmani and other leaders, held a meeting to chalk out the modalities and form a sub-committee, along with leaders of other parties. “Our endeavour is not to merely have seat adjustment, but to first have a common manifesto with a clear perspective that a serious challenge is to be posed to the BJP and the Congress,” said Rakesh Singha, CPM leader. He said though at the moment the BSP, SP and NCP were not part of the sub-committee, at a later stage they could also be roped in. The formation of a third front would also offer a platform to those BJP and Congress leaders who failed to secure Assembly tickets from their parties. Having a mass base, such leaders would stand a better chance of winning elections. Secretary of the party Rohit Thakur said with the sharp increase in the cost of various farm inputs, the cost production had more than doubled, but the government had not bothered to revise the procurement price under the MIS. As a result, growers were reeling under financial stress and demanded that the support price should be increased significantly to provide relief to growers. He said the apple harvesting season was just 20 days away, but the government had failed to improve the condition of the Theog-Hatkoti road that continued to be in a deplorable state. In 2010, it remained blocked for days together and growers suffered huge losses amounting to Rs 700 crore as they could not transport their produce to the market. The condition of various link roads was no better and growers would face problems if the government failed to repair these before the onset of rains. The state was expecting a good apple crop and the government should take urgent steps to improve the work on the Theog-Hatkoti road. Not only fruit growers, but various sections of the society were also disillusioned by policies, programmes and performance of the BJP and they were waiting for the Assembly polls to throw the party out of power. Though the government had set the deadline of June 30 as the last date for renewal of ration cards but with there being delay, work is yet to begin. The earlier plans to make ration cards on the basis of adhaar cards could also not take off as many people have yet to get adhaar cards. It might take some time before the new ration cards are made but greater problem has arisen from the fact that depot holders selling subsidised good grains and other food items are not providing ration on the old cards. Even though Food and Civil Supplies Minister Ramesh Dhawala said ration would be given on the old cards, it was the consumer who was facing the issue. The situation here in the state capital is even worse with the local Municipal Corporation expressing its inability to take on the task of preparing ration cards of 55,000 families residing in the town. Faced with the issue of staff shortage and paucity of space, the MC has already apprised the Secretary, Food and Civil Supplies, of the matter. Moreover, with the deadline of June 30 for getting the old 16.31 lakh ration cards renew expiring, card holders are groping in the dark as to how to get this document prepared. “In case the Shimla MC is unable to perform the task, I will direct the department to start this work as new ration cards have to be made ,” said Dhawala. He said almost eight lakh rations cards were ready and the remaining too would be prepared. The Food and Civil Supplies Department had taken the decision to get all the 16.31 lakh ration cards renewed at the same time before June 30 so as to plug the excess five lakh ration cards. Though the department had thought that with one-time renewal date they would be able to detect the fake or double ration cards, they failed to put a proper mechanism in place which would to cause inconvenience to consumers. The State Private Educational Institutions Regulatory Commission has amended the relevant rules in view of the gross irregularities detected in admissions, including some cases where admissions have been carried out and classes started even before the university actually came into being. 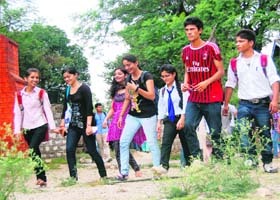 Moreover, a number of universities had admitted students after Class X in a blatant violation of law and these students face a dark future as degrees cannot be recognised. As per the amended rules, seats will be reserved for students belonging to the Scheduled Castes, the Scheduled Tribes and Other Backward Classes and handicapped students. In addition 25 per cent of seats will be reserved for bona fide Himachalis. All the private universities will maintain the records of the entire process of selection of students, including the answer sheets of the entrance test conducted for admissions in respect of each student, and will have to produce such record whenever called upon to do so by the commission. The duration of semesters (six months each) will be from July to December and January to June. The process of admissions will have to be completed latest by August 7 and for the subsequent semester by January 21. Each institution will have to ensure minimum 90 teaching days per semester as per UGC norms. The fees, as approved by the state government, will be collected in two equal instalments during the year at the commencement of each semester. The fees being charged and scholarships and concessions offered during the year will be prominently displayed on the website and notice board of the university. The meeting was held at McLeodganj under the aegis of the Tibetan settlement office. 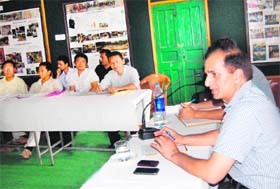 It was chaired by Diljeet Singh Thakur, SP, Kangra, on behalf of the district administration. The aim of the meeting was to sort out teething trouble for peaceful co-existence of the Tibetan and the Indian communities. Ajay Singh Mankotia, a local hotelier from McLeodganj, said lots of Tibetans were engaging middlemen for buying land for doing other kinds of business in Kangra district and other parts of the state. However, the middlemen were circumventing law for Tibetans, which was creating bitterness in both societies. On the one hand, Tibetans were feeling cheated and harassed for landing on the wrong side of the law, despite spending money, on the other hand state law enforcement agencies were feeling that Tibetan exiles were circumventing legal procedures, he said. The SP advised Tibetans to follow proper procedures in case they wanted to buy land or do business in the state rather than falling in the trap of touts. A lot of cases of benami properties raised by Tibetan exiles in the state have come to the fore in the recent past. Even central investigating agencies were tracing the source of money used to raise such properties. However, in a few cases investigating agencies have laid their hands on the unscrupulous middlemen who were facilitating the benami land deals for Tibetans here. The Tibetans present in the meeting raised the issues being faced by them in getting their registration certificates in the Baijnath area. They alleged that since the DSP was not posted at Baijnath, Tibetans living there have to come to Dharamsala for registration. The SP said a DSP would be posted at Baijnath soon. The issue of consistent clashes between Tibetan youth and local residents also came up for discussion during the meeting. During the recent tourist season in McLeodganj, there were many incidents of clashes between local residents and Tibetans. The SP asked the Tibetan settlement office to sensitise the Tibetan youth towards Indian laws. He said meetings should be arranged regularly between Tibetan and Indian businessmen to sort out differences. States are supposed to pool in 25 per cent of share for this scheme while 75 per cent would be borne by the Centre. This would help enhance the country’s share in global food trade from 1.6 per cent to 3 per cent while the level of processing for fruits and vegetables is envisaged to increase from the present 2.2 per cent to 10 per cent and 15 per cent in 2010 and 2015, respectively. The scheme has also lit a ray of hope for the agrarian community in the state, which can hope to get optimum price for their produce. A beginning has been made with the Industries Department setting up a food processing cell in its directorate at Shimla. The constitution of this cell follows a grant of Rs 1.12 crore under the NMFP to initiate preparatory activities to promote food processing industries. Explaining the nitty-gritty of the scheme, Rajinder Chauhan, adviser, Industries, said a state-level committee had been constituted to oversee the working of the cell and they would initiate preparatory activities, including chalking out an action plan envisioning the state’s vision for growth of food processing industries. Various activities, including technology upgrade, setting up of new units, modernisation and expansion of food processing industries, would be covered under the scheme. The possibility of opening a food processing training centre would also be explored as a consultant would be hired to prepare a vision document. The public would be educated about its usefulness through conducting promotional activities, including seminars, workshops, conducting studies, surveys, fairs and advertisement and publicity. Simultaneously, the Bakloh police would also function under the Chowari police station which is under Bhattiyat revenue sub-division. This decision came in the wake of the public demand as these areas already fall under Bhattiyat revenue subdivision. Disclosing this here today, SP, Chamba, Kuldeep Sharma said these areas included Nainikhud, Tunnuhatti, Chalama, Ghatasni, Kakira Kasba, Kakira Jarei, Khareda, Hobar, Balera, Gadana and Taragarh panchayats and the Cantonment Board Bakloh, adding that with this decision approximately 19,000 population of these panchayats would be benefited. These panchayat areas were earlier covered under the Bakloh police post of Dalhousie police station, and now the Bakloh police post, along with these panchayats areas, had been put under the control of Chowari police station. The notification had come into force with immediate effect and henceforth all the police related public works would now be carried out by Bakloh police post under the Chowari police station, the SP stated. The SP added that all the police records pertaining to these areas had also been sent to the Chowari police station. “Harsh Mahajan is likely to return to Chamba politics obeying the impending decision of the Congress party consequent upon the constant pressure of the Congress high command on him to contest the Assembly elections from here,” sources close to Mahajan revealed. In 2007 Mahajan had decided not to contest the Himachal Pradesh Vidhan Sabha elections for purely personal reasons despite a lot of persuasion by the then Chief Minister Virbhadra Singh. However, he remained a true worker and continued to serve in the Himachal Pradesh Congress party. Even at that time, Mahajan in a computer-typed letter addressed to the electorate of the Chamba Assembly constituency had appealed to them not to desert the Congress party, asserting that the Congress would again come back to power and Virbhadra would become the Chief Minister of the state. Mahajan, a three-time MLA from Chamba, had done landmark developmental works in his constituency. Among his achievements were setting up educational institutions, including a B Ed college, roads, bridges, buildings and opening up employment avenues. Mahajan had the longest tenure as the president of the HP Youth Congress from 1986 to 1995, besides holding high positions in the Congress. “It is only the presence of Harsh Mahajan in the political scene of Chamba district which can ameliorate the fate of the Congress party,” claim Meena Dhall, district president, Mahila Congress Committee, and Raj Singh, zila parishad member and Congress leader. Addressing a press conference here today, BJP legislator Randhir Sharma said the BJP was all geared to counter Virbhadra who has said he would take the fight on corruption to the people’s court. “We will play the CD on the basis of which charges have been framed against Virbhadra and his wife Pratibha so that nobody is left in any doubt about its authenticity,” he remarked. He also mocked at the former Chief Minister for taking pride in being given the responsibility of the campaign. “Rather than depicting his appointment as the head of the poll committee as an achievement, Virbhadra must admit that corruption is not an issue as far as the Congress is concerned,” he remarked. He said the BJP would make corruption, price rise and discrimination by the Congress-led UPA regime against the state as its main poll plank in the Assembly elections. “We will seek votes on the basis of development works undertaken by the Dhumal regime,” he said. He refuted reports of infighting plaguing the BJP and said Shanta Kumar and PK Dhumal would jointly work for ensuring the return of the BJP. Rajender appealed to the candidates aspiring to get BJP ticket to show their competence for strengthening the organisation and dedicate themselves wholeheartedly to the service of the party. “Indiscipline in the organisation will not be brooked at any cost,” Rajender stated, adding that the BJP Yuva Morcha was serious about maintaining discipline in the organisation at all costs. He also made it clear that allotting the party ticket came within the purview of the high command of the BJP. During her series of meetings at different places in Chamba district, she called upon Congress party workers to be “confident” instead of being “over-confident” as the Congress party was set to come back to power in Himachal Pradesh. She advised party activists to see that the schemes and programmes launched by the UPA government for the uplift of the masses and the all-round development of the country should reach the common masses. She also impressed upon the party workers to disseminate the development schemes and programmes of the UPA government amongst the masses. All-India Mahila Congress District president Meena Dhall urged the poll observer to see that the forthcoming Assembly elections in the district was contested under the leadership of former Cabinet minister Harsh Mahajan who had the political prowess to achieve a thumping victory on all the five seats of Chamba district. The first phase of the tour of Jahida Khan in the district concluded today. The police failed to locate his cell phone from the vehicle, and since nothing else was found missing it could not be a case of looting, confirmed police officials. The official had sought half-day leave from his office on Saturday and informed his office through an SMS about his unavailability for the remaining part of the day, confirmed BSNL officials. SP Hardesh Bisht said as per the location of his cell phone on Saturday, he appeared to be in the Rabon area. Interestingly, after committing the murder his vehicle was parked in its usual place of parking near his office at Rabon. This meant that the culprits might have watched his movements for days before executing the crime. The official had been attacked a few years ago near Dharampur when he had been brutally beaten up and thrown down a gorge. He had had a miraculous escape that time. The SP said they were verifying the details of this mishap from Dharampur police station. The post-mortem report was yet to be received. The body has been handed over to the family who took it to their native place in Muzzafarnagar, Uttar Pradesh, for conducting the last rites. The birthday would also be celebrated to mark the historic devolution of his political authority to the democratically-elected Tibetan leadership and the conferment of the prestigious Templeton Prize on the Dalai Lama. President of the forum SN Kapoor alleged that pensioners were being ignored by the government that had passed a law making it mandatory for wards to look after their parents. The government had ordered that the arrears of pay revision and dearness allowance of regular employees be cleared by July 7, which was laudable, but there was no word on the issue in respect of pensioners. He said even demands and issues pertaining to pensioners were not being addressed. 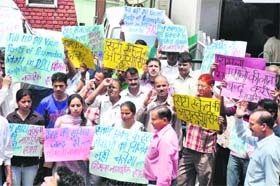 He urged Dhumal to intervene and issue suitable directions to board to settle demands and claims of pensioners forthwith. A meeting of the general house of the forum would be convened shortly at Solan to discuss the issue and efforts were being made to ensure the presence of the Chief Minister as the chief guest on the occasion. The procurement price had been raised form Rs 4.60 per kg to Rs 5 per kg for seedling verities and from Rs 5.25 per kg to Rs 6 per kg for the grafted mango varieties. Handling charges to procurement agencies would be Rs 1.30 per kg. The police said it was totally wrong to make such charges as the Himachal Police was a professional organisation, which works objectively, impartially and fairly as per the law of the land. He said it would be far better if Virbhadra comes out of his “feudal” mentality and faces trial in the court with humility, respecting the criminal justice system of the country. Police spokesperson said the Congress leader had allegedly even threatened some of the witnesses with dire consequences, of which there was sufficient evidence with the State Vigilance and Anti-Corruption Bureau.